Well, since it's about time for Avery to turn 19 months, I figured I should probably get on here and get her 18 month old post done, right?! Gotta love life back at school. Things sure get a little crazy around here, but I still manage to snap hundreds of pictures of Avery, so to free up some space on my memory card, it's time to finally share them with you. 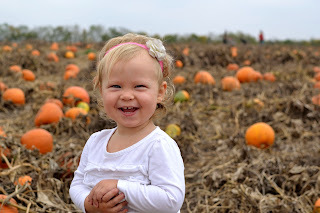 It's been a fun and busy month, with Halloween, Brandon's birthday, and just watching Avery grow, talk, and turn into the "not-so-little girl" that she is. This month's photo shoot, was not exactly the highlight of the month. She has quite a hatred for the chalkboard sign, why did I think that was a good idea when she turned 13 months old? ( : By some miracle, I did get her happy and smiling for this pic. Probably because I was singing, "Old MacDondald Had a Farm" for the hundredth time, and it was at her favorite part..."Ei Ei O!" Here's the look I got when I handed her the sign...if looks could kill. 1. Favorite food: avocados. She will literally eat one whole avocado in a sitting. Runner up favorite food is still frozen strawberries. 2. Favorite thing to do: Relax in her chair and put her feet up, she calls it "feet up." ""What can I say, I like to relax." Feet up on a toy box. Second favorite thing to do: Take things out and then put them back in, or as she says, "Put it in, take it out." She'll do this with water, dirt, rocks, sand, and cereal as you can see below. and then put it back again. "What can I say, it's fun!" One more favorite thing to do...pretending to talk on any item that even resembles a cell phone. She'll say, "Hello," or "Hi Mommy," "Bye Daddy". Gotta love the way she can multitask already. 3. Favorite thing: water towers. Yes, I am talking about the water towers you see while you are out driving. She loves these things. It started because we talk a lot about what we see when we are out driving around like stop lights, horses, gas stations, grocery stores, and most recently, water towers. So after driving by them and talking about them time and time again, we decided to go on a "Water Tower Tour" one day and boy did she have fun! Lucky for her, there are some parks below a few water towers in our city. So aside from seeing the "huge water towers" (as she says) we also got to swing, slide, and run around. A water tower in our city. She was all smiles when we arrived. down it more times than I can count. to climb the stair and do it again. Water towers + Daddy= One happy girl! Now it wouldn't be a "Water Tower Tour" with just one water tower...so we headed to another water tower in the area (that had a park). A water fountain in the shape of a lion! "Teeth teeth" she would say. Any other Ed Sheeran fans? 1. Running/walking in a local race that's a tradition for my mom and I...and now Avery. by walking at the very end. Fun event #2: Dad's Birthday, so to follow suit to the picture we made last year in this post, we took another D-A-D picture. As you can imagine, it was a bit more difficult than last year, but it was worth it. Brandon loved it. Fun in the field with Mommy. She loved it so much that she wouldn't let us put a pumpkin in! So we walked home empty handed, from the pumpkin patch, can you believe that? But we weren't too sad, we already had a pumpkin at home and the $20 charge to enter was plenty for us. Maybe next year we'll actually buy a pumpkin from the pumpkin patch. "Who needs pumpkins? I've got this wheel barrow." I can't believe how much she's changed in just one year. So there we have it, a year and a half old...can you believe it? Who would have thought she'd grow up to be one water tower-loving, avocado-eating, hilarious, spunky little girl? We sure love you Avery. 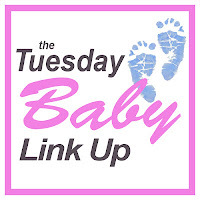 Recently this post was linked up to a blog party called, "Tuesday Baby Link Up". This is where other bloggers can gather together and share their baby-related posts, such as: pregnancy & birth, adoption, newborn & baby, or toddler & child. 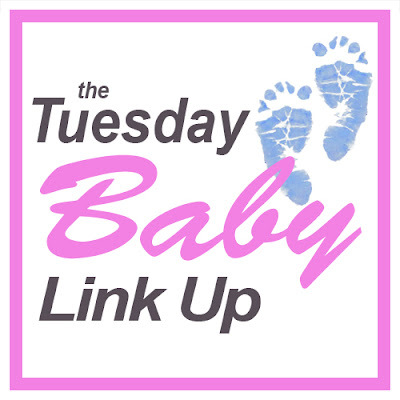 You can find more of the "Tuesday Baby Link Up" over at the blog I Thought I Knew Mama, as well as a number of other blogs that are listed in the link above. So hop on over and check out some other fun baby posts!